“The Marvelous is Free” is an exhibition of archival and historical ephemera that places St. Louis’ Black Artists’ Group, a collective of African American experimentalists working in theater, visual arts, dance, poetry, and jazz, within a network of like-minded artists and activists producing similar experiments in politics, form, and community between the late 60s and early 70s. Exhibit curators Anthony Romero and Matt Joynt bring together a range of rarely seen objects, films, and ephemera from personal and institutional collections and present a landscape of art and activism that includes the Black Arts Movement, Queer Liberation, the struggle for Latina/o civil rights, and more. –Information courtesy of The Luminary. For more details, visit their website. For more information on the Women’s Resource Center Records, see the online finding aid. Washington University Libraries Film & Media Archive presents a traveling exhibition from the Wisconsin Historical Society on Freedom Summer, Risking Everything. Through September 29, visitors can see the exhibit on Level One of Olin Library featuring materials selected from over 1,100 boxes of unpublished papers created by individual activists, community groups, and national organizations. Confluence Preparatory Academy students tour the “Risking Everything” exhibition in Olin Library. The Wisconsin Historical Society also has a companion website for the exhibit that contains more detailed explanations and over 30,000 digitized primary documents and photos that can be viewed in their original context. All documents are from the Wisconsin Historical Society’s online archive of Freedom Summer records. Rudolph Clay, African & African American Studies Librarian, and Urban Studies Librarian speaks to students from the Confluence Preparatory Academy. — at Washington University Libraries – Olin Library. Gathered during the mid-1960s, this collection is an incredible rich source of primary documents created by volunteers with the Student Nonviolent Coordination Committee (SNCC) and other activists who were engaged at the grass-roots level in the deep South during Freedom Summer. After Freedom Summer graduate students Bob and Vicki Gabriner, and Mimi Feingold Real who were studying at the University of Wisconsin saw an opportunity to create an archive that would document the extraordinary things they had seen and experienced working in the South. For more on the history of the collection, see this article. Confluence Preparatory Academy students tour the “Remembering Mississippi Freedom Summer” exhibition in Olin Library. — at Washington University Libraries – Olin Library. The Freedom Summer Records are a perfect companion to the Film Archive’s Henry Hampton Collection and the recently acquired Richard Beymer Collection both of which also have many primary source interviews, photographs, film, and documents relating to Freedom Summer. An exhibit of material from these two collections, Remembering Mississippi Freedom Summer can be viewed in the Grand Staircase Lobby & Gingko Room in Olin Library through October 25. These three collections focus on activists and volunteers who may not have been famous but who were the backbone of the movement, including Amzie Moore, Unita Blackwell, Victoria Gray Adams, and the numerous students, volunteers, and courageous residents who dared to register to vote. Vincent Harding passed away on May 19, 2014. He was 82 and was an advisor to Martin Luther King, Jr. for ten years, and later acted as an academic series advisor on Eyes on the Prize and The Great Depression. Harding helped King write his speech Beyond Vietnam-A Time to Break Silence, which took a bold anti-war stance and alienated many of King’s supporters, including President Johnson. Harding was among a core group of King supporters who carried on his programs after he was assassinated. Harding was not only a historian, but as someone who had lived through many of the pivotal events of the civil rights movement, he was an ideal person for Henry Hampton to bring into his project, Eyes on the Prize. One unique primary resource at the Film and Media Archive are educational sessions that Henry Hampton organized called “school.” These were two-week sessions that Hampton organized for Blackside producers where he invited scholars, activists, historians, and others to come and talk about their experiences. These sessions were invaluable as they gave producers an in-depth immersion into the subject matter, and a chance to talk to people who had lived through many of the events that would make up the stories of Eyes on the Prize. Harding was a key participant in the Hampton’s “school” and conducted sessions for Eyes on the Prize I, and II, and The Great Depression. Blackside also conducted pre-interviews with Harding for Eyes on the Prize II, and This Far by Faith, and the Film Archive holds a filmed interview Harding conducted for This Far By Faith. Some of the material only exists in audio format, but there are video sessions as well. These are unique materials that have been digitized and are available to view in the Film and Media Archive. Please contact the Film Archive for more information. Fully searchable resource brings invaluable, previously inaccessible oral history within reach. In March of 1992, many years after photographer Dorothea Lange’s 1936 image of a migrant mother in California became one of the most iconic images from the Great Depression, a camera crew sat down with two daughters of the subject of Lange’s photo. Portrait shows Florence Owens Thompson with several of her children in a photograph known as “Migrant Mother” by Dorothea Lange. For about 40 minutes, Rydlewski and McIntosh shared their stories with Blackside, Inc., a film company founded by 1961 Washington University graduate Henry Hampton. In the footage and transcript of that conversation, now accessible for the first time along with many more such interviews through WU Libraries, the family’s daily challenges come to life. The sisters describe not only their strong, beautiful mother but everything from field work and playing with dirt clods as children to early union meetings and the economical “saving grace” that was World War II. When The Great Depression, Blackside’s seven-part documentary series, debuted on PBS in October of 1993, the program wove together short segments from extensive interviews with 148 people who experienced the Great Depression, including Rydlewski and McIntosh. As illuminating as the documentary is in its own right, the many additional hours of oral history that Blackside recorded in the process of creating it are a treasure trove of primary source material—all of it newly viewable, browsable, and searchable online. The diverse range of individuals whose reflections on the 1930s are now easily accessible include a grandson of Franklin D. and Eleanor Rooselvelt, celebrated authors Maya Angelou and Gore Vidal, longtime New York Times political reporter Warren Moscow, actors Karen Morley and Ossie Davis, Morton Newman, who worked on the Upton Sinclair campaign for governor in California, and many more from all walks of life. The multicultural, multiregional approach brings needed depth and color to an era that is often remembered and depicted as a monolithic event dragging the nation down for a decade, says Film & Media Archive assistant Alison Carrick, who managed the workflow of the digitization project. Hone adds that in working through every minute of the interviews and taking notes in the process, he’s been struck by the stories of human survival, persistence, and endurance. The Great Depression Interviews project illustrates the rich collections that WU Libraries staff members are bringing within easy reach of students, faculty, and the wider world. It’s also one example of the collaborative, complex nature of the work required to do so. From early steps like identifying the types of media on which each interview exists and cataloging the camera rolls, sound rolls, and video items, to transcribing and encoding the content in text files according to best practices, to the digitization of more than 300 videocassettes and final design of the online, user-friendly interface, efforts to make such collections as freely accessible and usable as possible are far from simple. Archive staff work closely with the Digital Library Services unit to bring such projects to fruition. The result is a seamless, powerful tool with much potential for interdisciplinary research. The homepage URL for The Great Depression Interviews is digital.wustl.edu/greatdepression. 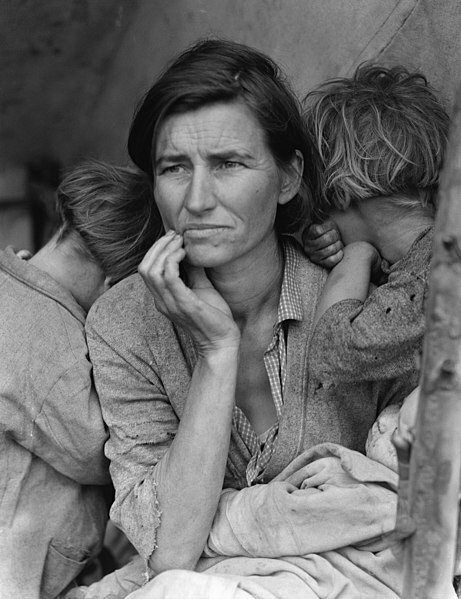 Photo information for image above: Among the scores of interviewees whose reflections on the Great Depression comprise a newly accessible WU Libraries resource are two daughters of Florence Owens Thompson, the subject of Dorothea Lange’s iconic photograph. Article by Evie Hemphill (@evhemphill), a writer and photographer for Washington University Libraries in St. Louis. The Visual Media Resource Laboratory (VMRL) and Department of Special Collections hosted an open house Thursday, January 16 in Olin Library. A wide array of print resources and digital collections—many of them new—were on display in various public areas of Level 1. Curators, archivists, and other staff were on hand to discuss the resources, answer questions, or lead activities. Some highlights from the event were a photo booth with a green screen where participants could create photos of themselves using images from the Sharepoint database with images from the collections. Full transcripts and video footage of nearly 150 interviews conducted for The Great Depression, a documentary by the same filmmakers who produced Eyes on the Prize. The documentary featured a tiny fraction of these fascinating interviews with people from all walks of life. This new resource, never before available, offers much more. An extensive digital exhibition about William Gass,celebrated author of fiction and literary criticism and WU professor emeritus of philosophy. The exhibition focuses on his education, military service, teaching career, and literary achievements. A digital exhibition about James Merrill, an influential, Pulitzer Prize-winning poet who left his manuscripts and many other personal items to WU. A photo booth, where participants learn about the library’s image database and have a photo taken of themselves in a historic image from our collections. Fashion Design Program Records of WU fashion shows and student designs, now held in University Archives. A sampling of materials from Rare Books and Manuscripts, with more on display in the Department of Special Collections. Samplings of materials from the collections of the Modern Graphic History Library (MGHL), an archive of 19th- and 20th-century illustrations. Giveaways of buttons featuring images from WU’s special collections. World War I posters from the newly acquired Louis and Jodi Atkin collection. Vote to determine which poster will be the first to be displayed for an extended period of time. An exhibition—In Character: The Life and Legacy of Mary Wickes—continues in the Grand Staircase Lobby and Ginkgo Room. Wickes, a famous character actress, was a WU alumna whose scripts, correspondence, photos, and other memorabilia are in University Archives. A continuing exhibit of miniature books from the Julian Edison Collection. The opportunity to visit the Department of Special Collections to view materials on display there. Shiloh Baptist Church in Albany, Georgia. Photo by Danny Lyon. The Film & Media Archive presents an exhibition on photography and the civil rights movement. Featuring images and books from photographers who helped document the dramatic moments in the movement including Danny Lyon, James Karales, Charles Moore, Leonard Freed, and Bruce Davidson. Henry Hampton’s documentary series Eyes on the Prize began with the story of Emmett Till’s murder. Up until Till’s murder, every year there were disappearances and unprosecuted murders and lynchings of African-Americans. The shock of the Till case was amplified by his mother’s decision to allow a photograph of his battered and mutilated body be published in Jet magazine. Of course, violent acts had occurred for many years before the 1950s, what was different was the revealing of these images in the mainstream media. Protesters attacked with fire hoses in Birmingham, Alabama, 1963. Photo by Charles Moore. Untitled, Time of Change (Damn the Defiant), 1963. Photography: Bruce Davidson/Magnum Photos. Another moment which was captured on film and photograph was the Selma to Montgomery March. The iconic image of the march captured by James Karales was used in the promotional and cover art of Eyes on the Prize. The exhibit will run from January – May, 2013, and can be viewed at the at the Film & Media Archive, Monday – Friday – 8:30-5:00 p.m.